Join your fellow CEOs at the Digital Transformation Summit, Dec. 8, 2015. According to McKinsey & Company, digital capabilities will increasingly determine which companies create or lose value, and must commit to transforming themselves into full digital businesses. So how can leaders build a culture that fosters transformation, innovation and delivers digital dividends? Here are 4 suggestions. 1. Lead with a digital vision. Most organizations today employ a bottoms-up approach to their digital initiatives, often delegating them to IT or Marketing. Yet, only the top layer of a company can create a compelling vision of the future and communicate it throughout the organization. Digital leaders build digital into their overarching vision. 2. Keep the customer at the center of your vision. Digital commerce is evolving at a faster pace than most organizations can respond to and customer expectations are accelerating right along with it. It is critical to align people, process and technology to foster innovation and relentlessly evolve to improve the customer experience across the entire value chain. 3. Be undaunted. Few organizations have been through business transformation, so this evolution is new territory for most leaders. The mantra to “continuously iterate and fail fast” is a new way of thinking for business leaders who have gained their experience in a traditional, non-digital, business model. Don’t become paralyzed by the potential cost of acquiring new technologies, eBusiness implementations, perceived conflicts between channels, operational challenges, etc. Simply stated, a digital transformation vision often involves reframing traditional methods of doing business. The challenge for CEOs is to lead this significant change while still overseeing the business and keeping maximum alignment with customers, suppliers and employees. 4. Realize this is a journey, not a project. Digital business transformation is a multi-year corporate-wide effort, requiring resources to support the strategy, execution and continued evolution. And, once you achieve your goal(s), you should set new ones. Technology advancements are ongoing and your customer behavior is always changing. Your company should never stop working to stay ahead. Joe Nettemeyer, CEO of Valin Corporation, has led efforts to transform Valin from a traditional ‘pick, pack and ship’ distributor to a valued single-source solution center. In 2001, after just 120 days as CEO of Valin, the dot-com bubble burst and the business went from a $75 million company to a $25 million company. After finding itself operating in a market with a narrow band of products and tremendous price and margin pressure, the company knew its choices were limited: either change or cease to exist. The transition from a focus on transactional business to value-add business resulted in a six-fold increase in company value over the last five years, leading Valin to embrace an aggressive digital transformation strategy to continue its evolution. Valin understood that to make its e-business vision a reality would require full participation from the entire organization. To do this, Valin built a cross-departmental team to work with its e-commerce vendor to formulate its digital transformation vision. Once the vision was created, the next step was planning and implementation. Valin put together a comprehensive digital strategy and an investment roadmap, understanding that building a new application infrastructure is a long-term project and demanded a phased approach with milestones. To better understand the ROI of its e-business implementation, Valin projected the expected business benefits over a three-year period, and calculated a three-year payback on its new e-commerce platform. For Valin, it was no longer about if the company should invest in building an e-business business structure; it was imperative for the company to build a digital strategy and investment roadmap to sustain its business over the next five to10 years. Under Nettemeyer’s direction, the cross-departmental team worked to identify and correct process inefficiencies to align the business with its e-business strategy. The amount of collaboration needed to implement this strategy resulted in the breaking down of many departmental silos. The secret of Valin’s success? 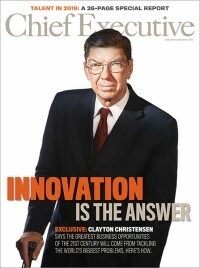 Nettemeyer embodied the key principle that CEOs must embrace in today’s digital age: Challenge everything. Leaders must resist the centrifugal force of legacy thinking and the perceived safety of the status-quo; instead CEOs should view these disruptive times as a unique opportunity to reinvent their business and operating models to achieve new exponential growth. Tony Abena joined Insite Software as CEO in 2014. He has a 20-year track record of accelerating product, sales and talent growth in both small and large companies in a number of industries including software/SaaS, information/data services and professional services.